Salma received her Bachelor of Arts in English Literature in 1984 from Alexandria University . Joined the firm in 2011, She handles trade marks issues, particularly advice on registrability and availability of trade marks. Analysis of searches and counsel in cases of conflicts to guide clients to the proper solutions. Providing clients with advice regarding applicable IP law provisions in cases of merger , change of ownership and transfer. Contact with clients regarding IPR infringements by third parties and possible remedies. Successfully combated infringement by third parties to marks owned by major clients. 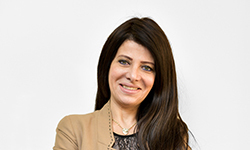 Salma is a member of International Trademark Association (INTA) and Egyptian Maritime Society, and a board member at the Egyptian Association for Protection of Industrial Property (AEPPI).